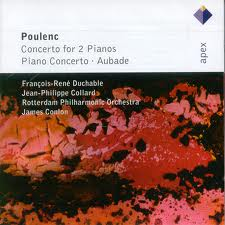 The very name, "Poulenc", conjures up Frenchness to me. Today, using "shuffle", I decided to listen to whatever iTunes came up with. Delightfully, it came up with Poulenc's Piano Concerto. I actually saw this piece performed at City Halls, Glasgow a few years ago with the piano played by Ian Fountain. In my opinion, Fountain's performance was faultless. The critic of the Glasgow Herald described Fountain's playing as "brittle". I had, and still have, no idea what he meant by that.